¡Todos Somos Ayotzinapa! Free the 11 - We Are the 11! ALL 11 STUDENTS HAVE BEEN RELEASED!! Free the 11 / We Are the 11! We stand with faculty and students, the artistic community, community organizations, workers and civil society in exercising their political right to peaceful protest, free speech and assembly in Mexico and demand that political and democratic rights be respected by the Mexican government. These students are presently political prisoners of a state near collapse, which has been consistently implicated, in endemic corruption and severe and systematic violations of human rights. The lives of the 11 students are in jeopardy. They have been transferred to notoriously dangerous high security prisons in Mexico. We hold the Mexican government responsible for their safety. 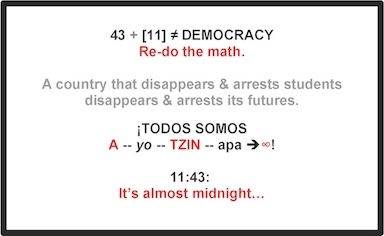 FREE THE 11: Luis Carlos Pichardo Moreno, Francisco García Martínez, Tania Ivonne Damián Rijas, Juan Daniel López Ávila, Hulary Analy González Olguin, Atzín Andrade González, Roberto César Gasso del Ángel, Laurence Maxwell, Lilia Graduño Ortega, Issac Domínguez Ayala y Hugo Bautista Hernández.